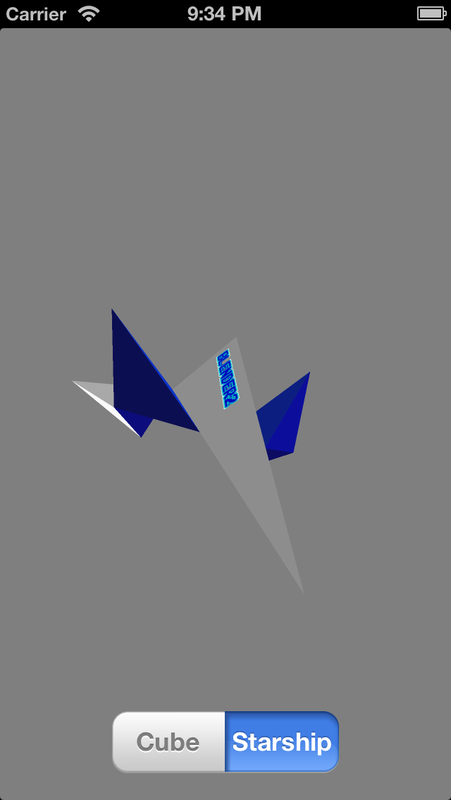 Learn all about OpenGL ES Transformations by making a 3D, gesture-based model viewer. 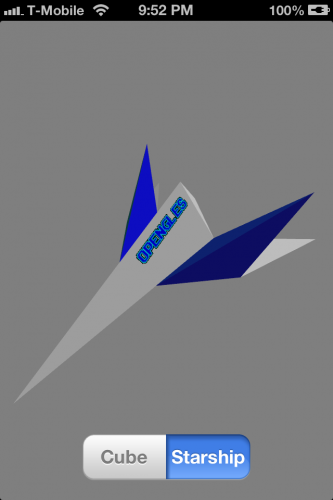 In this tutorial, you’ll learn how to use gestures to control OpenGL ES transformations by building a sophisticated model viewer app for 3D objects. For this app, you’ll take maximum advantage of the iPhone’s touchscreen to implement an incredibly intuitive interface. You’ll also learn a bit of 3D math and use this knowledge to master basic model manipulation. The hard work has already been done for you, specifically in our tutorial series How To Export Blender Models to OpenGL ES, allowing you to concentrate on nothing but transformations and gestures. The aforementioned series is an excellent build-up to this tutorial, since you’ll be using virtually the same code and resources. If you missed it, you’ll also be fine if you’ve read our OpenGL ES 2.0 for iPhone or Beginning OpenGL ES 2.0 with GLKit tutorials. Note: Since this is literally a “hands-on” tutorial that depends on gestures, you’ll definitely need an iOS device to fully appreciate the implementation. The iPhone/iPad Simulator can’t simulate all the gestures covered here. First, download the starter pack for this tutorial. 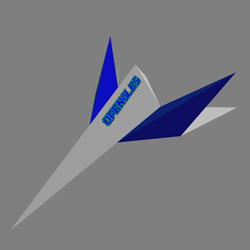 As mentioned before, this is essentially the same project featured in our Blender to OpenGL ES tutorial series. However, the project has been refactored to present a neat and tidy GLKit View Controller class—MainViewController—that hides most of the OpenGL ES shader implementation and 3D model rendering. The current model viewer is very simple, allowing you to view two different models in a fixed position. So far it’s not terribly interesting, which is why you’ll be adding the wow factor by implementing gesture recognizers! Any new iPhone/iPad user will have marveled at the smooth gestures that allow you to navigate the OS and its apps, such as pinching to zoom or swiping to scroll. The 3D graphics world is definitely taking notice, since a lot of high-end software, including games, requires a three-button mouse or double thumbsticks to navigate their worlds. Touchscreen devices have changed all this and allow for new forms of input and expression. If you’re really forward-thinking, you may have already implemented gestures in your apps. The first thing you need to do is add them to your interface. 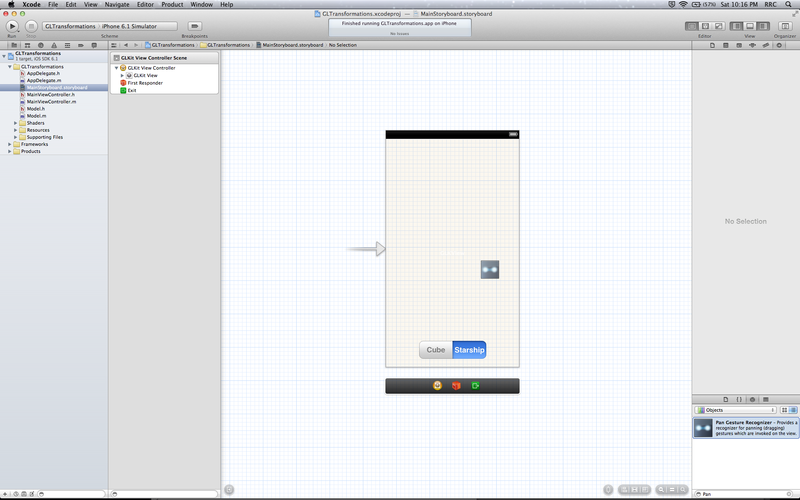 Revert Xcode back to your Standard editor view and open MainStoryboard.storyboard. Select your Pan Gesture Recognizer and turn your attention to the right sidebar. Click on the Attributes inspector tab and set the Maximum number of Touches to 2, since you’ll only be handling one-finger and two-finger pans. As you might have guessed, these are simple console output statements to test your four new gestures, so let’s do just that: build and run! Perform all four gestures on your device and check the console to verify your actions. At the beginning of every new pan, you set the touch point of the gesture (translation) as the origin (0.0, 0.0) for the event. While the event is active, you divide its reported coordinates over its total view size (width for x, height for y) to get a total range of 1.0 in each direction. For example, if the gesture event begins in the middle of the view, then its range will be: -0.5 ≤ x ≤ +0.5 from left to right and -0.5 ≤ y ≤ +0.5 from top to bottom. Pop quiz! If the gesture event begins in the top-left corner of the view, what is its range? At the beginning of every new pinch, the distance between your two fingers has a scale of 1.0. If you bring your fingers together, the scale of the gesture decreases for a zoom-out effect. If you move your fingers apart, the scale of the gesture increases for a zoom-in effect. A new rotation gesture always begins at 0.0 radians, which you conveniently convert to degrees for this exercise with the function GLKMathRadiansToDegrees(). A clockwise rotation increases the reported angle, while a counterclockwise rotation decreases the reported angle. Build and run! Once again, perform all four gestures on your device and check the console to verify your actions. You should see that pinching inward logs a decrease in the scale, rotating clockwise logs a positive angle and panning to the bottom-right logs a positive displacement. With your gesture recognizers all set, you’ll now create a new class to handle your transformations. 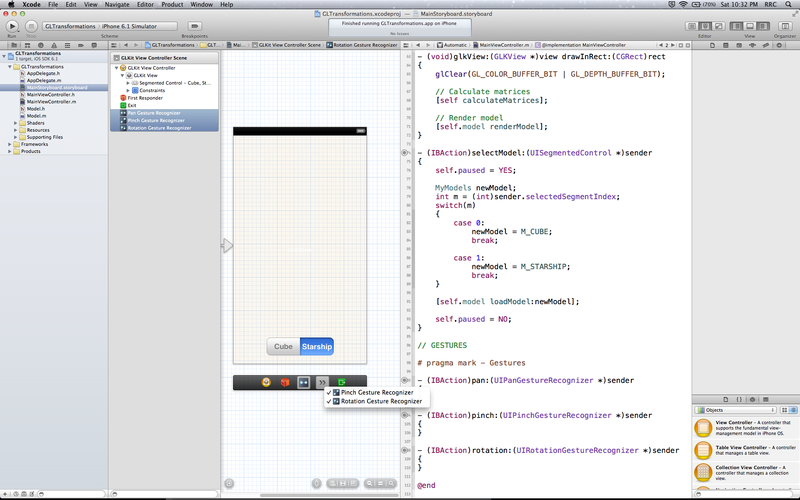 Click File\New\File… and choose the iOS\Cocoa Touch\Objective-C class template. Enter Transformations for the class and NSObject for the subclass. Make sure both checkboxes are unchecked, click Next and then click Create. These are the main methods you’ll implement to control your model’s transformations. You’ll examine each in detail within their own sections of the tutorial, but for now they will mostly remain dummy implementations. _depth is a variable specific to Transformations which will determine the depth of your object in the scene. You assign the variable z to _depth in your initializer, and nowhere else. You position your model-view matrix at the (x,y) center of your view with the values (0.0, 0.0) and with a z-value of -_depth. You do this because, in OpenGL ES, the negative z-axis runs into the screen. The only value doing anything here is the depth of 5.0f. You’re using this value because the projection matrix of your scene has near and far clipping planes of 0.1f and 10.0f, respectively (see the function calculateMatrices), thus placing your model right in the middle of the scene. Build and run! Your starship is still there, but it appears to have shrunk! All of your transformations will have start and end values. The end value will be the one actually transforming your model-view matrix, while the start value will track the gesture’s event data. With that line, you scale your model-view matrix uniformly in (x,y,z) space. Build and run! Your starship will be twice as big as your last run and look a lot more proportional to the size of your scene. As mentioned before, the starting scale value of a pinch gesture is 1.0, increasing with a zoom-in event and decreasing with a zoom-out event. You haven’t assigned a value to _scaleStart yet, so here’s a quick question: should it be 1.0? Or maybe s? The answer is neither. If you assign either of those values to _scaleStart, then every time the user performs a new scale gesture, the model-view matrix will scale back to either 1.0 or s before scaling up or down. This will cause the model to suddenly contract or expand, creating a jittery experience. You want your model to conserve its latest scale so that the transformation is continuously smooth. touchesBegan:withEvent: is the first method to respond whenever your iOS device detects a touch on the screen, before the gesture recognizers kick in. Therefore, it’s the perfect place to call start and conserve your scale values. m is a multiplier that helps convert screen coordinates into OpenGL ES coordinates. 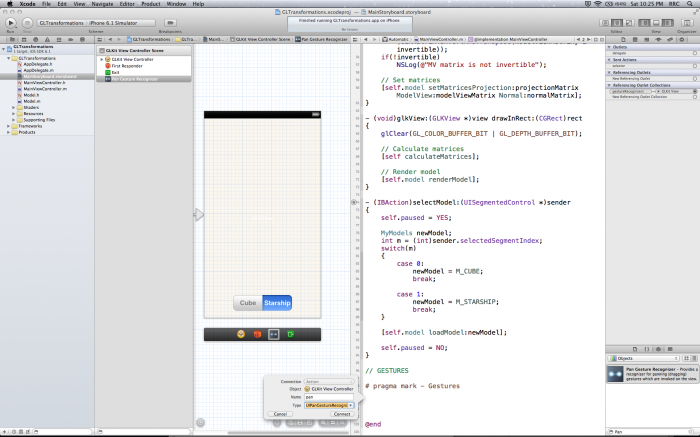 It is defined when you call the function from MainViewController.m. dx and dy represent the rate of change of the current translation in x and y, relative to the latest position of _translationEnd. In screen coordinates, the y-axis is positive in the downwards direction and negative in the upwards direction. In OpenGL ES, the opposite is true. Therefore, you subtract the rate of change in y from _translationEnd.y. Finally, you update _translationEnd and _translationStart to reflect the new end and start positions, respectively. As mentioned before, the starting translation value of a new pan gesture is (0.0, 0.0). That means all new translations will be relative to this origin point, regardless of where the model actually is in the scene. It also means the value assigned to _translationStart for every new pan gesture will always be the origin. 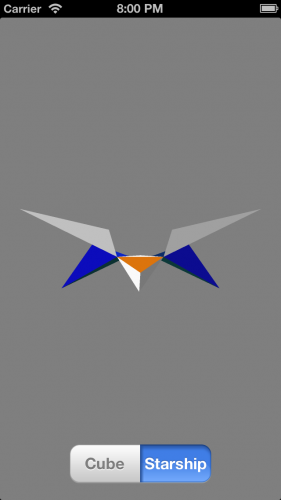 Before you move onto the last transformation—rotation—you need to know a bit about quaternions. This lesson will thankfully be pretty quick, though, since GLKit provides an excellent math library to deal with quaternions. 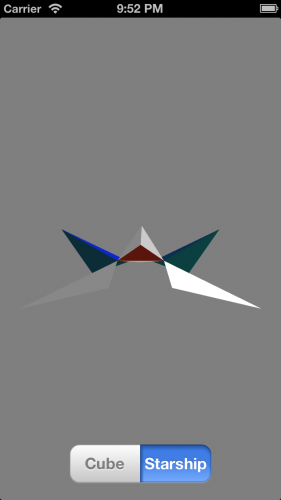 Quaternions are a complex mathematical system with many applications, but for this tutorial you’ll only be concerned with their spatial rotation properties. The main advantage of quaternions in this respect is that they don’t suffer from gimbal lock, unlike Euler angles. Euler angles are a common representation for rotations, usually in (x,y,z) form. When rotating an object in this space, there are many opportunities for two axes to align with each other. In these cases, one degree of freedom is lost since any change to either of the aligned axes applies the same rotation to the object being transformed—that is, the two axes become one. That is a gimbal lock, and it will cause unexpected results and jittery animations. A gimbal lock, from Wikipedia. 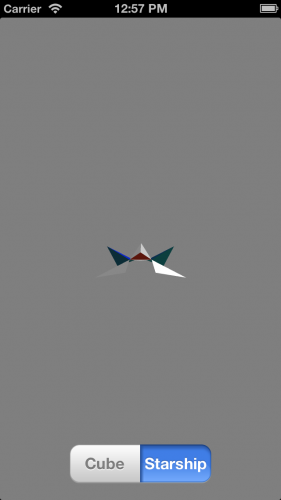 Create a quaternion that represents a rotation around an axis. For each (x,y,z) axis, multiply the resulting quaternion against a master quaternion. Derive the 4×4 matrix that performs an (x,y,z) rotation based on a quaternion. Calculate the product of the resulting matrix with the main model-view matrix. Quaternions and Euler angles are very deep subjects, so check out these summaries from CH Robotics if you wish to learn more: Understanding Euler Angles and Understanding Quaternions. 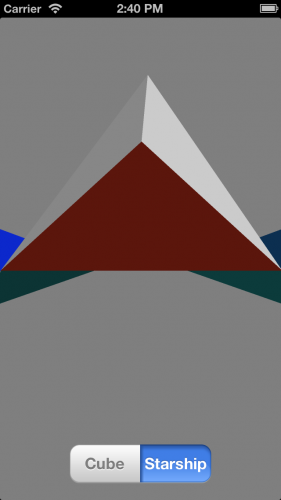 Pinch produces a single float, perfect for a uniform scale across all three (x,y,z) axes. One-finger pan produces two values corresponding to movement along the x-axis and the y-axis, just like your translation implementation. 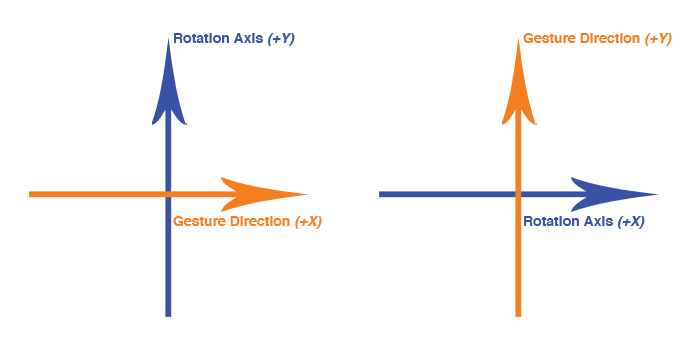 No gesture can accurately represent rotation in 3D space. Therefore, you must define your own rule for this transformation. Rotation about the z-axis is very straightforward and intuitive with the rotation gesture, but rotation about the x-axis and/or y-axis is slightly more complicated. Thankfully, the two-finger pan gesture reports movement along both of these axes. With a little more effort, you can use it to represent a rotation. As mentioned before, your quaternions will represent a rotation around an axis. This axis is actually a vector, since it specifies a direction—it’s not along z, it’s either front-facing or back-facing. 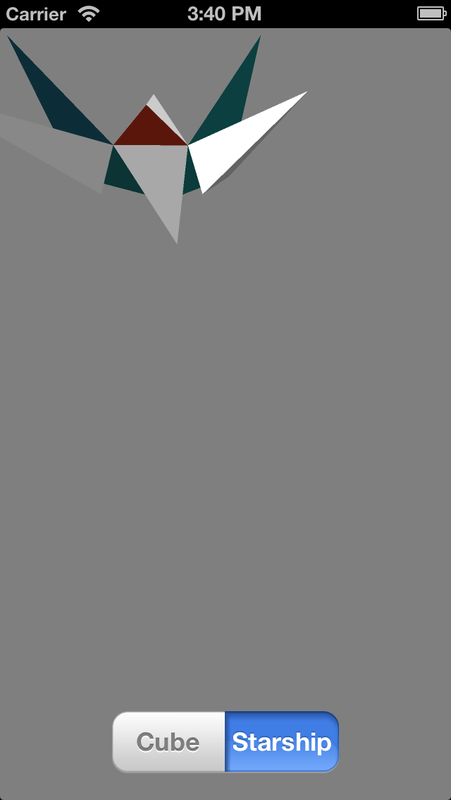 As you can see, the vector is front-facing because its direction is towards the screen. Note: Previously, I mentioned that in OpenGL ES, negative z-values go into the screen. This is because OpenGL ES uses a right-handed coordinate system. GLKit, on the other hand (pun intended), uses the more conventional left-handed coordinate system. You create a quaternion that represents a rotation around an axis by using GLKQuaternionMakeWithAngleAndVector3Axis(). You multiply the resulting quaternion against a master quaternion using GLKQuaternionMultiply(). All calculations are performed with radians, hence the call to GLKMathDegreesToRadians(). 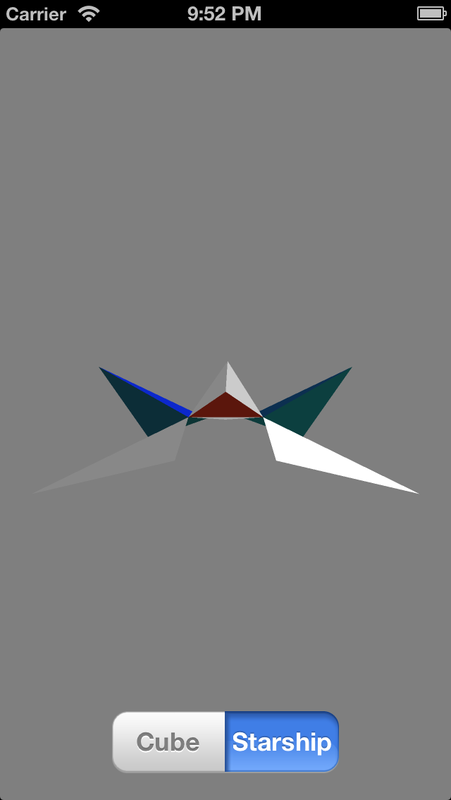 With quaternions, a positive angle performs a counterclockwise rotation, so you send in the negative value of your angle: -r.z. You derive the 4×4 matrix that performs an (x,y,z) rotation based on a quaternion, using GLKMatrix4MakeWithQuaternion(). You calculate the product of the resulting matrix with the main model-view matrix using GLKMatrix4Multiply(). Starting from point P: take n steps forward; turn to your left; then pretend to be a giant twice your size. Starting from point P: pretend to be a giant twice your size; turn to your left; then take n steps forward. Even though the instructions have the same steps, the two people end up at different points, P’1 and P’2. 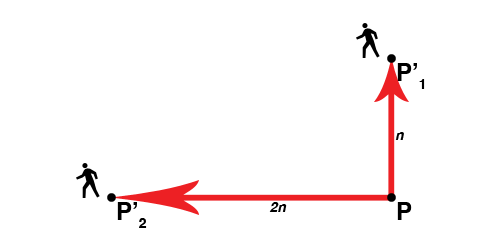 This is because Person 1 first walks (translation), then turns (rotation), then grows (scale), thus ending n paces in front of point P. With the other order, Person 2 first grows, then turns, then walks, thus taking giant-sized steps towards the left and ending 2n paces to the left of point P.
Build and run! You’ve caught your starship in the middle of a barrel roll. After you’ve verified that this worked, revert the change, since you would rather have your app launch with the starship properly oriented. This is a combination of your initialization code and your translation implementation. dz represents the rate of change of the current rotation about the z-axis. 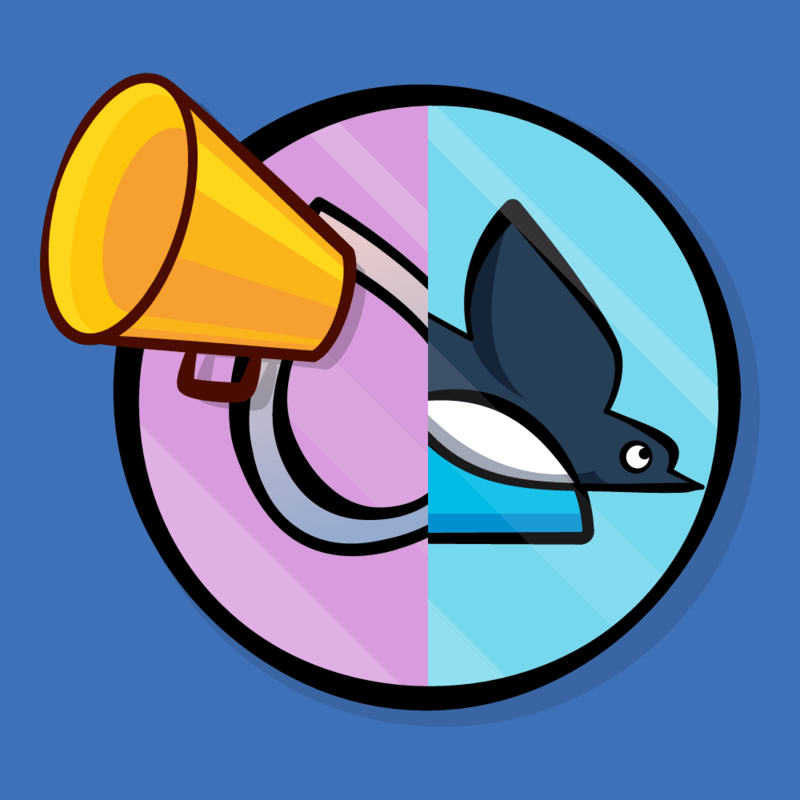 Then you simply update _rotationStart and _rotationEnd to reflect the new start and end positions, respectively. There is no need to convert r.z to radians this time, since the rotation gesture’s values are already in radians. r.x and r.y will be passed along as 0.0, so you don’t need to worry about them too much—for now. As you know, a new rotation gesture always begins with a starting value of 0.0. Therefore, all new rotations will be relative to this zero angle, regardless of your model’s actual orientation. Consequently, the value assigned to _rotationStart for every new rotation gesture will always be an angle of zero for each axis. Since a full rotation gesture perfectly spans 360 degrees, there is no need to implement a multiplier here, but you’ll find it very useful in the next section. 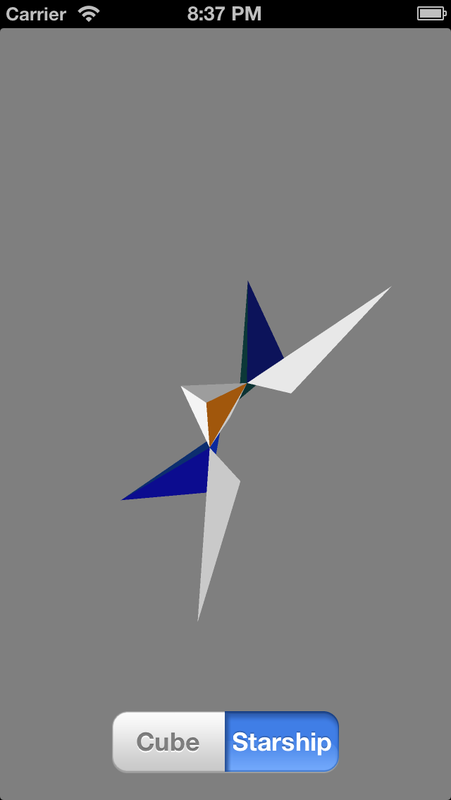 This implementation for rotation about the x-axis and/or y-axis is very similar to the one you just coded for rotation about the z-axis, so let’s start with a little challenge! And you finally get to use m! A pan gesture doesn’t report its values in radians or even degrees, but rather as 2D points, so m serves as a converter from points to radians. The value of m dictates that for every touch-point moved in the x- and/or y-direction, your model rotates 0.5 degrees. Build and run! Your model is fully rotational. Woo-hoo! Nice one—that’s a pretty fancy model viewer you’ve built! You’ve fully implemented your transformations, but you may have noticed that sometimes the interface accidentally alternates between two transformations—for example, if you remove a finger too soon or perform an unclear gesture. To keep this from happening, you’ll now write some code to make sure your model viewer only performs one transformation for every continuous touch. state defines the current transformation state of your model viewer app, whether it be a scale (S_SCALE), translation (S_TRANSLATION) or rotation (S_ROTATION). S_NEW is a value that will be active whenever the user performs a new gesture. See if you can implement the rest of the transformation states in their corresponding methods. Click below to see the solution for the other two—but give it your best shot first! Build and run! See what cool poses you can set for your model and have fun playing with your new app. Congratulations on completing this OpenGL ES Transformations With Gestures tutorial! 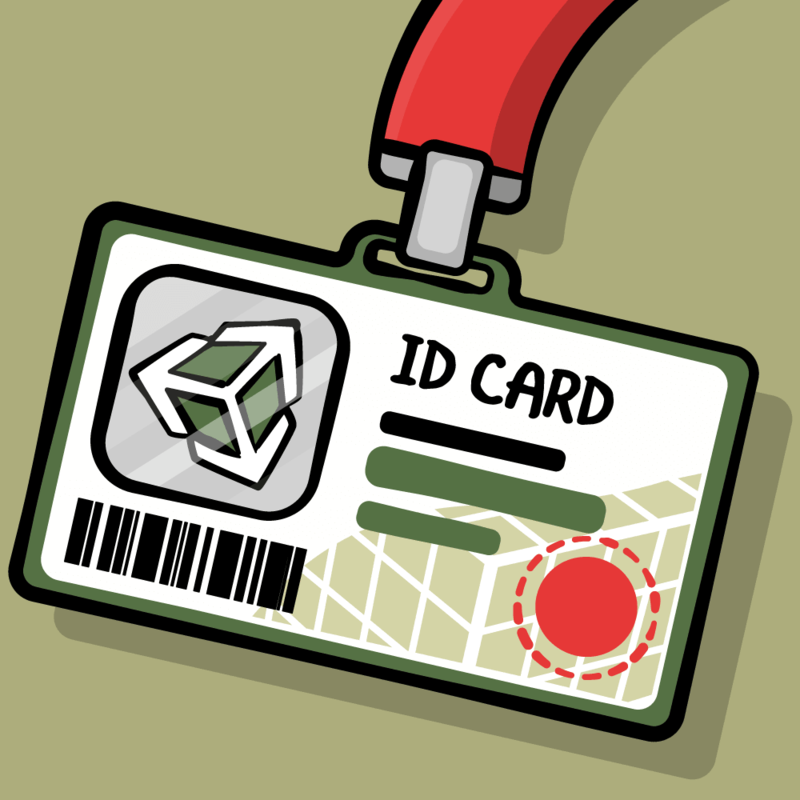 Here is the completed project with all of the code and resources from this tutorial. You can also find its repository on GitHub. If you completed this tutorial, you’ve developed a sophisticated model viewer using the latest technologies from Apple for 3D graphics (GLKit and OpenGL ES) and touch-based user interaction (gesture recognizers). Most of these technologies are unique to mobile devices, so you’ve definitely learned enough to boost your mobile development credentials!